The ultimate goal of root canal system obturation is to provide a hermetic seal to prevent the leakage of fluid and antigenic agents into or from the peri-radicular tissue [1Sundqvist G, Figdor D, Persson S, Sjögren U. Microbiologic analysis of teeth with failed endodontic treatment and the outcome of conservative re-treatment. Oral Surg Oral Med Oral Pathol Oral Radiol Endod 1998; 85(1): 86-93. [http://dx.doi.org/10.1016/S1079-2104(98)90404-8] [PMID: 9474621] ]. The essential components of a root filling are: a solid core material and a sealer. The widely used core material is gutta-percha, which occupies the bulk of the canal space while the root canal sealer fills the interface between the core material and dentine wall [2Salz U, Poppe D, Sbicego S, Roulet JF. Sealing properties of a new root canal sealer. Int Endod J 2009; 42(12): 1084-9. [http://dx.doi.org/10.1111/j.1365-2591.2009.01635.x] [PMID: 19912379] ]. A variety of endodontic sealers are available commercially and they are divided into different groups according to their chemical composition such as zinc oxide eugenol, glass ionomer, calcium hydroxide, silicon and resin. Several studies have been carried out to compare the sealing property of various sealers, but there is hardly any common consensus [3Chailertvanitkul P, Saunders WP, Mackenzie D. An assessment of microbial coronal leakage in teeth root filled with gutta-percha and three different sealers. Int Endod J 1996; 29(6): 387-92. [http://dx.doi.org/10.1111/j.1365-2591.1996.tb01403.x] [PMID: 10332239] , 4Miletić I, Anić I, Pezelj-Ribarić S, Jukić S. Leakage of five root canal sealers. Int Endod J 1999; 32(5): 415-8. [http://dx.doi.org/10.1046/j.1365-2591.1999.00254.x] [PMID: 10551116] ]. Some studies showed that the resin-based sealer provided a better seal than other sealers [5Monticelli F, Sadek FT, Schuster GS, et al. Efficacy of two contemporary single-cone filling techniques in preventing bacterial leakage. J Endod 2007; 33(3): 310-3. [http://dx.doi.org/10.1016/j.joen.2006.11.012] [PMID: 17320722] -8Economides N, Liolios E, Kolokuris I, Beltes P. Long-term evaluation of the influence of smear layer removal on the sealing ability of different sealers. J Endod 1999; 25(2): 123-5. [http://dx.doi.org/10.1016/S0099-2399(99)80010-7] [PMID: 10204470] ]. Recently, bioceramic based sealers have been introduced in endodontics. They are compatible, antibacterial and bind to dentinal tubules, which improve the sealing ability and prevent the microleakage [9Vitti RP, Prati C, Silva EJ, et al. Physical properties of MTA Fillapex sealer. J Endod 2013; 39(7): 915-8. [http://dx.doi.org/10.1016/j.joen.2013.04.015] [PMID: 23791263] ]. Total Fill BC sealer is a new calcium silicate based sealer that has not much investigated in terms of its capability to serve as the apical seal. Apical leakage is considered the common cause for endodontic failure and is influenced by many variables such as different filling techniques, chemical and physical properties of root canal filling materials and presence and absence of smear layer [10Pommel L, Jacquot B, Camps J. Lack of correlation among three methods for evaluation of apical leakage. J Endod 2001; 27(5): 347-50. [http://dx.doi.org/10.1097/00004770-200105000-00010] [PMID: 11485254] , 11Valois C, de Castro A. Comparison of the apical sealing ability of four root canal sealers. J Bras Endo 2002; 3: 317-22.]. Several methods to evaluate leakage have been used in endodontic including dye penetration, bacterial penetration, and fluid filtration methods [12Veríssimo DM, do Vale MS. Methodologies for assessment of apical and coronal leakage of endodontic filling materials: A critical review. J Oral Sci 2006; 48(3): 93-8. [http://dx.doi.org/10.2334/josnusd.48.93] [PMID: 17023739] -14Vasconcelos BC, Bernardes RA, Duarte MA, Bramante CM, Moraes IG. Apical sealing of root canal fillings performed with five different endodontic sealers: Analysis by fluid filtration. J Appl Oral Sci 2011; 19(4): 324-8. [http://dx.doi.org/10.1590/S1678-77572011005000005] [PMID: 21655776] ]. The dye extraction technique has long been used in endodontic because it gives a quantitative result, it is easy, does not require sophisticated materials and takes into account all absorbed dye in the samples [15Bargholz C. Perforation repair with mineral trioxide aggregate: A modified matrix concept. Int Endod J 2005; 38(1): 59-69. [http://dx.doi.org/10.1111/j.1365-2591.2004.00901.x] [PMID: 15606825] ]. The purpose of this investigation is to evaluate the apical sealing ability of Total fill BC sealer and AH Plus sealer using a single cone and continuous wave compaction obturation techniques with dye extraction method. Eighty-four human permanent single-rooted teeth were collected and used in the study. All teeth were cleaned of extraneous tissue and calculus by using an ultrasonic scaler and exposed to digital radiograph from facial and proximal side to ensure the presence of a single root canal with the fully developed apex. Under stereomicroscope with x35 magnification, each tooth was examined to confirm one apical canal opening, absence of apical cracks and root fracture. Each tooth was radiographed in Buccolingual (BL) and Mesiodistal (MD) projections to evaluate the shape of the root canal and check if there is any of the exclusion criteria. The canal measured at 5mm from the apex. The cross-section morphology of the root canal is classified as round when the radiographic measurement of MD and BL or Diameter Ratio (DR) is similar. The coronal portion of all teeth was removed using a Precision Saw under the cement-enamel junction to standardize the root length of 12 mm from the anatomic apex measured by digital caliper. The working length was determined by subtracting 1mm from the total length of the root by using 10-K file. Biomechanical preparation of the canals was performed by using a crown-down technique with the iRace rotary file system (FKG, Switzerland) starting with R1, R2, R3, #35 and #40 with 0.04 taper. Each canal was irrigated after each rotary file with 1 ml 5.25% NaOCL using a disposable side vented needle with 30 G and ensuring patency by extrusion of the solution beyond the apical foramen. Finally, the root canal was irrigated with 3 ml of 17% EDTA solution for one minute (Meta Biomed, Korea) followed by 3 ml of 5.25% sodium hypochlorite for one minute, and then flushed with 5 ml of distilled water. All the canals were dried with paper point size 40 with 0.04 taper until dry paper point come out. After completing the biomechanical preparation, the roots were coated with two layers of nail varnish and to prevent covering the apical foramen with nail varnish, a size 10-K file was placed passing through it. Each coat was left to dry before the next layer was applied to the surface of the root. Group A1: Total Fill BC sealer (FKG, Switzerland) was used with single cone obturation technique. Group A2: Total Fill BC sealer was used with continuous wave condensation technique (Elements system, Kerr, USA). Group B1: AH Plus sealer (Dentsply, Germany) has been used with single cone obturation technique. Group B2: AH Plus sealer was used with continuous wave condensation technique. Positive control: Two samples were used in which the canals were not obturated. The roots were coated with two layers of nail varnish except the apical opening. Negative control: Two samples were obturated by using single cone gutta-percha size 40 with 0.04 taper with AH Plus sealer, and they were sealed apically with two layers of nail varnish to prevent the dye penetration. A 2 ml of 1% concentration methylene blue dye was injected into a glass vial to assess the apical seal. Each root was sealed using silicon glue into the vial, and then each vial was inverted in which the apical foramen pointing upward to be sure that apical part covered completely with the dye and the gravity will enhance dye penetration stored in a dark cabinet at room temperature for a period of seven days. Then they were taken out and washed thoroughly with running tap water until the clear water was seen in the container. Samples were dried, and nail varnish was removed by scratching it with a scalpel blade. The teeth were then placed in a glass test tube filled with 4.0 ml of 65% nitric acid solution for 72 hr. The solutions were centrifuged for 7 minutes at 4000 rpm (EBA, USA) and the supernatant was subjected to absorbance measurements. The absorbance of leaked dye, in nm, from each sample, was measured by using UV mini 1240 spectrophotometer device (Shimadzu, Japan) with photometric mode and 600 nm lambda in a standardized volume of 3.0 ml of a solution of each sample. The absorbance of each sample of all groups was measured three times using the same zircon cuvette (Beckman, California, USA). The same operator measured all samples on the same day under the same conditions. Standard solutions of 1%, 0.5%, 0.1%, 0.05% and 0.01% of methylene blue in 65% nitric acid were prepared and stored for 72 hours in dark cabinet at room temperature. Cs: The prepared Known concentration of methylene blue dye. As: The absorbance of the prepared known concentration of methylene blue dye measured by spectrophotometer. Au: The absorbance of the unknown sample determined by spectrophotometer. Cu: Concentration of the unknown sample. All the samples absorption were applied to the equation to discover the amount of methylene blue dye concentration in it. Data were collected and submitted to statistical analysis using a software program (IBM SPSS statistics, version 22, Chicago, IL, USA). The data were analyzed using One-way analysis of variance (ANOVA). A P-value of < 0.05 was considered statistically significant. All the experimental groups showed an apical leakage (Fig. 1 ). The means and standard deviations of dye concentration were as follows: Total Fill BC with a single cone (0.012 ± 0.012), Total Fill BC with continuous wave condensation (0.016 ± 0.013), AH plus with a single cone (0.011 ± 0.011), AH plus with continuous wave condensation (0.015 ± 0.009). Bar chart shows dye concentration µg/ml for all study groups. The result of this study showed there was no significant difference found between the four groups using the One way ANOVA test (F = 0.938) (Table 1). One- way ANOVA statistics of the dye concentrations (µg/ml) in study groups. A variety of sealers have been used in endodontics. Total Fill BC sealer is recently presented. The bioceramic endodontic sealer consists of calcium silicate and calcium phosphate groups. The manufacturer stated that the sealer is biocompatible and nontoxic. Total Fill BC sealer has the same composition of Endosequence BC sealer and has both excellent physical properties and biocompatibility. Superior qualities and handling abilities make Total Fill BC sealer as an innovative novel root canal sealer that does not shrink during setting and hardens in the presence of moisture [16Zang W, Li Z, Peng B. Assessment of new root canal sealers apical sealing ability. Oral Surg Oral Med Oral Pathol Oral Radiol Endod 2009; 107(6): 79-82. [http://dx.doi.org/10.1016/j.tripleo.2009.02.024] ]. The small particle size, hydrophilicity and low contact angle of this cement allow it to spread easily over the dentinal walls of the canal and get inside and fill the lateral microcanals. It also exhibits a significant expansion of 0.20%. These features create a gap-free chemical bond between the sealer and dentinal walls [17Kossev D, Stefanov V. Ceramics-based sealers as new alternative to currently used endodontic sealers. Res Ceramics-based Seal 2009; 1: 42-8.]. The setting reaction of Total Fill BC sealer initiated by moisture and the final set was achieved approximately two hours later with the calcium silicate portion of the material producing a calcium silicate hydrate gel and calcium hydroxide. The calcium hydroxide then interacted with phosphate ions from dentine to form hydroxyapatite and water. The water produced continued to react with the calcium silicate to precipitate additional gel-like calcium silicate hydrate [18Ma J, Shen Y, Stojicic S, Haapasalo M. Biocompatibility of two novel root repair materials. J Endod 2011; 37(6): 793-8. [http://dx.doi.org/10.1016/j.joen.2011.02.029] [PMID: 21787491] ]. The result of the present study showed that there were no significant differences between the four experimental groups when evaluated by dye extraction method using One Way ANOVA statistical analysis (P > 0.05). Zang et al. in 2009 [16Zang W, Li Z, Peng B. Assessment of new root canal sealers apical sealing ability. Oral Surg Oral Med Oral Pathol Oral Radiol Endod 2009; 107(6): 79-82. 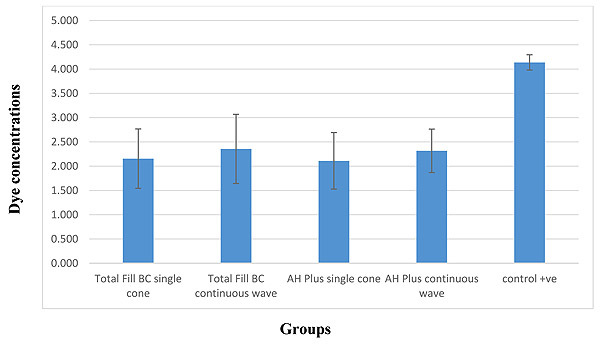 [http://dx.doi.org/10.1016/j.tripleo.2009.02.024] ] concluded in their research that there were no significant differences in the apical leakage between iRoot and AH Plus using single cone and continuous wave condensation techniques. iRoot is a calcium silicate bioceramic sealer that has almost the same composition of Total Fill BC Sealer. Bayram et al. 2017 [19Bayram H, Brayam E, Kanber M, Celikten B, Saklar F. Effect of different chelating solutions on the push- out bond strength of various root canal sealers. Biomed Res 2017; (Special issue): S401-6. ], compared the push-out strength of AH Plus, MTA Fillapex and Total Fill BC sealer in mandibular premolars. The AH Plus and Total Fill BC sealer showed similar strength in bonds to the root canal wall. A study done by Sagsen et al. 2011 [20Sagsen B, Ustün Y, Demirbuga S, Pala K. Push-out bond strength of two new calcium silicate-based endodontic sealers to root canal dentine. Int Endod J 2011; 44(12): 1088-91. [http://dx.doi.org/10.1111/j.1365-2591.2011.01925.x] [PMID: 21895700] ], assessed the push out bond strength of two calcium silicate based endodontic sealers MTA and iRoot SP and compared them with AH Plus sealer in root canals of extracted teeth, and found that in the coronal specimen, there was no significant difference between the sealers. Although there were no significant differences between the two groups (A1 and B1) in the outcome of this study, the single cone with Total Fill BC showed more apical leakage than single cone with AH Plus sealer. Similar results were concluded in a study conducted by Polineni et al. 2016 [21Polineni S, Bolla N, Mandava P, Vemuri S, Mallela M, Gandham VM. Marginal adaptation of newer root canal sealers to dentin: A SEM study. J Conserv Dent 2016; 19(4): 360-3. [http://dx.doi.org/10.4103/0972-0707.186453] [PMID: 27563187] ] when they assessed the marginal adaptation of epoxy resin based sealer Micro Megaseal sealer (Epoxy resin sealer), MTA Fillapex and Endosequence BC sealer to dentine with single cone obturation technique using the scanning electron microscopy. The epoxy resin sealer showed better marginal adaptation than BC sealer and MTA fillapex. The variation in dentin surface energy because of using EDTA solution can significantly reduce its wetting ability and thus reduce the adhesion of hydrophilic root canal sealer [22Al-Zaka I, Ammar A, Hikmet A, Mehdi J. The effect of different root canal irrigants on the sealing ability of bioceramic sealer. MDJ 2013; 1: 1-7.]. The superior adaptation of the epoxy resin sealer could be due to its ability to bond to root dentine chemically by reacting with any exposed amino groups in collagen to form a covalent bond between the resin and collagen upon opening of epoxide ring [23Gade VJ, Belsare LD, Patil S, Bhede R, Gade JR. Evaluation of push-out bond strength of endosequence BC sealer with lateral condensation and thermoplasticized technique: An in vitro study. J Conserv Dent 2015; 18(2): 124-7. [http://dx.doi.org/10.4103/0972-0707.153075] [PMID: 25829690] ]. Unlike alkaline bioceramic based sealers, AH Plus sealer is slightly acidic and might result in self-etching when in contact with dentine, thereby enhancing interfacial bonding and adaptation [24Al-Haddad A, Abu Kasim NH, Che Ab Aziz ZA. Interfacial adaptation and thickness of bioceramic-based root canal sealers. Dent Mater J 2015; 34(4): 516-21. [http://dx.doi.org/10.4012/dmj.2015-049] [PMID: 26235718] ]. In the current study, the use of calcium silicate sealer with single cone obturation technique resulted in less leakage compared to continuous wave condensation technique. DeLong et al. 2015 [25DeLong C, He J, Woodmansey KF. The effect of obturation technique on the push-out bond strength of calcium silicate sealers. J Endod 2015; 41(3): 385-8. [http://dx.doi.org/10.1016/j.joen.2014.11.002] [PMID: 25576202] ], evaluated the effect of obturation technique on the push-out bond strength of calcium silicate sealers. They concluded that bioceramic and MTA Plus sealers showed favorable bond strengths when used with single cone obturation technique. The continuous wave obturation technique decreases the bond strength of the bioceramic sealers. They stated that it is possible that the system B heat source mechanically removes the sealer during the down-pack, thus reducing or eliminating it from the canal. Viapiana et al. [26Viapiana R, Baluci CA, Tanomaru-Filho M, Camilleri J. Investigation of chemical changes in sealers during application of the warm vertical compaction technique. Int Endod J 2015; 48(1): 16-27. [http://dx.doi.org/10.1111/iej.12271] [PMID: 24697552] ] in their study found minimal chemical changes in bioceramic sealer (MTA Plus) when subjected to warm vertical compaction. Hegde and Arora [27Hegde V, Arora S. Sealing ability of three hydrophilic single-cone obturation systems: An in vitro glucose leakage study. Contemp Clin Dent 2015; 6(Suppl. 1): S86-9. [http://dx.doi.org/10.4103/0976-237X.152953] [PMID: 25821383] ] showed that the Endosequnce BC sealer provides superior sealing ability with the single cone obturation technique. McMichael et al. [28McMichael GE, Primus CM, Opperman LA. Dentinal tubule penetration of tricalcium silicate sealers. J Endod 2016; 42(4): 632-6. 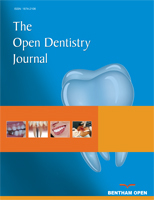 [http://dx.doi.org/10.1016/j.joen.2015.12.012] [PMID: 26898564] ] obtained similar outcomes in this study in which they examined the dentinal tubules penetration of tricalcium silicate sealers using continuous wave condensation and single cone obturation techniques. They concluded that the continuous wave condensation and single cone obturation techniques produced similar tubule penetration at both 1mm and the 5mm level with the tricalcium silicate sealers. A recent study by Kim et al. [29Kim S, Kim S, Park JW, Jung IY, Shin SJ. Comparison of the percentage of voids in the canal filling of a calcium silicate-based sealer and gutta-percha cones using two obturation tehniques. Materials (Basel) 2017; 10(10): 1170. [http://dx.doi.org/10.3390/ma10101170] ] evaluated the root filling quality of calcium silicate based sealer with both single cone and continuous wave condensation obturation techniques by measuring the percentage of voids. They concluded that the percentage of voids inside the filling materials was significantly higher in the continuous wave condensation obturation groups, except in the apical area of the distal canal. The voids between the filling material and canal wall in the apical area were not significantly different between the two techniques. No types of sealers and obturation techniques used in the current study prevented apical microleakage. There were no significant differences in apical microleakage between the Total Fill BC sealer and AH plus sealer when used in two different obturation techniques (single cone and continuous wave of compaction technique) using the dye extraction method. The single cone can provide a similar apical seal of canal filling as can be achieved by using continuous wave condensation methods, in the round canal. Ethical approval to conduct the study was obtained from the Research Ethics Committee at Ajman University (RD- 2016/ 17-10). Following review by the Research Ethics Committee, College of Dentistry, Ajman University of Science and Technology, permission is granted for this study to proceed as given in the proposal taking in consideration that a waiver of consent has been permitted. Valois C, de Castro A. Comparison of the apical sealing ability of four root canal sealers. J Bras Endo 2002; 3: 317-22. Kossev D, Stefanov V. Ceramics-based sealers as new alternative to currently used endodontic sealers. Res Ceramics-based Seal 2009; 1: 42-8. Bayram H, Brayam E, Kanber M, Celikten B, Saklar F. Effect of different chelating solutions on the push- out bond strength of various root canal sealers. Biomed Res 2017; (Special issue): S401-6. Al-Zaka I, Ammar A, Hikmet A, Mehdi J. The effect of different root canal irrigants on the sealing ability of bioceramic sealer. MDJ 2013; 1: 1-7.